"But the dress hadn't come easily. Carr couldn't find any fabric in England to cre­ate the sensuous yet metallic look she had in mind. 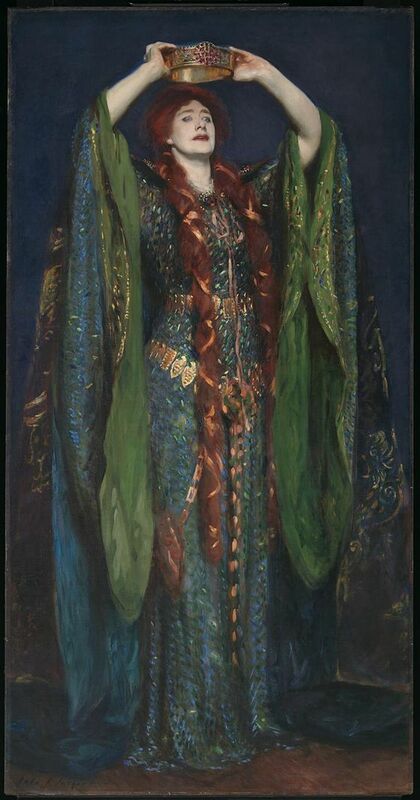 She imported fine yarn from Bohemia -- strands of green silk twisted with blue tinsel -- and then crocheted the yarn into a dress based on a thirteenth-century design. It was floor length with large sweeping sleeves, but still lacked the theatri­cal brilliance to project to the final row of the theater. Inspiration came in the form of luminous insects. Carr had countless iridescent beetle wings sewn all over the dress. In a finishing touch, she arranged rubies and diamonds along the edges of the costume to create Celtic-style patterns. "Upon seeing Terry in that fabulous dress with her hair hanging to her knees -- 'magenta hair!' Sargent exulted in a letter to the art collec­tor Isabella Stewart Gardner in Boston -- Sargent knew that he had to paint her in full costume. It took some arm-twisting, but Terry finally relented and arrived by carriage to Sargent's Tire Street studio one soggy morning. (Across the road, Oscar Wilde was riveted as he looked out his library window to witness 'the vision of Lady Macbeth in full regalia magnificently seated in a four-wheeler.' Such 'wonderful possibilities' the street now possessed, Wilde mused.)"